American Express Business Gold Rewards Signup Bonus Increased to 75,000 Points! Update 6: (5/9): There is a new link which shouldn’t require incognito browsers or mobile devices. See my post here. Update 5: (3/2): The offer is still alive for 75k! Update 3: Read the comments to see what is working in terms of different browsers, incognito modes etc..
Update 2: Ok this is really bizarre. I tried copying the link and pasting into a new Chrome browser and I got a 75k offer for spending $10k in 3 months. This was a brand new Chrome window, not incognito. See snapshot from Chrome browser on my iPhone at bottom of this post. No idea what is going on but play around with this! It looks like best bet is to open in a Chrome browser on your smartphone for the 75k offer per another commenter who confirmed with Amex that he was approved for the 75k bonus. Update: Some are reporting link is only showing 25k offer. I tried on a MacBook and iPhone, both in Safari, and it showed 50k. I was not logged into Amex. Maybe try Safari browser or incognito mode? That screenshot below was from my iPhone. 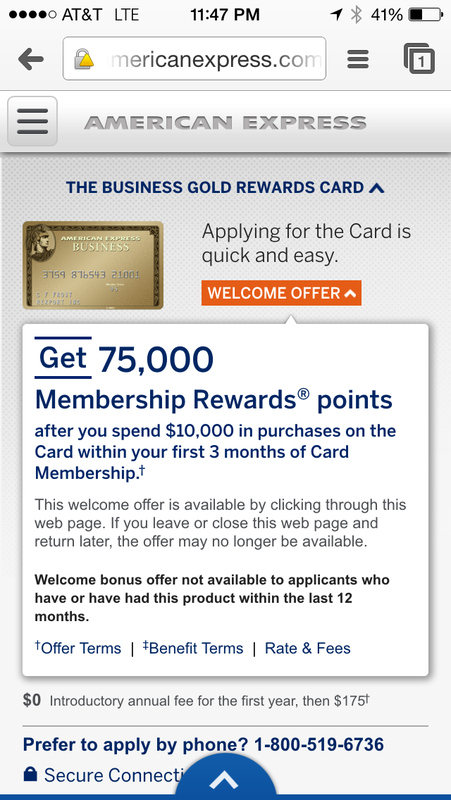 While helping a client figure out the next business card he should apply for via my consulting services, I noticed the offer on the American Express Business Gold Card has increased to 50,000 (updated: now 75,000) points! I believe the normal offer on this card is only 25,000 and a quick check on other blogs shows the affiliates link are only a 25,000 point offer. 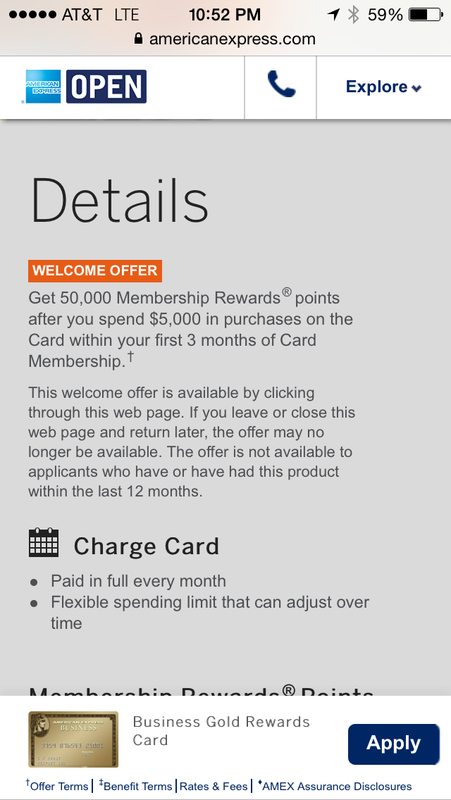 This 50,000 point offer requires you to spend $5k in 3 months (updated: the 75k offer requires 10k spend in 3 months). It is not available to those who have this card in the past 12 months. The annual fee is also waived for the first year. Click here for the link to the offer. I am boarding a redeye flight home from the #westcoastDO (and I’m posting from my phone so I apologize for the brevity of this post) so I don’t have the time right now to completely analyze this offer but with the annual fee waived for the first year and an extra 25k (updated: 50k) membership rewards compared to the public offer, this is a strong offer to consider. Post your experience in the comments and let me know which offer you got and how. I have tried from a Mac computer and my iPhone, both on a Safari browser. It came up 50k each time. Try incoingto mode? I copied link and used Chrome browser on my Android and got the 75k offer! are you sure we can apply for this card again if we haven’t had it for at least 12 months? 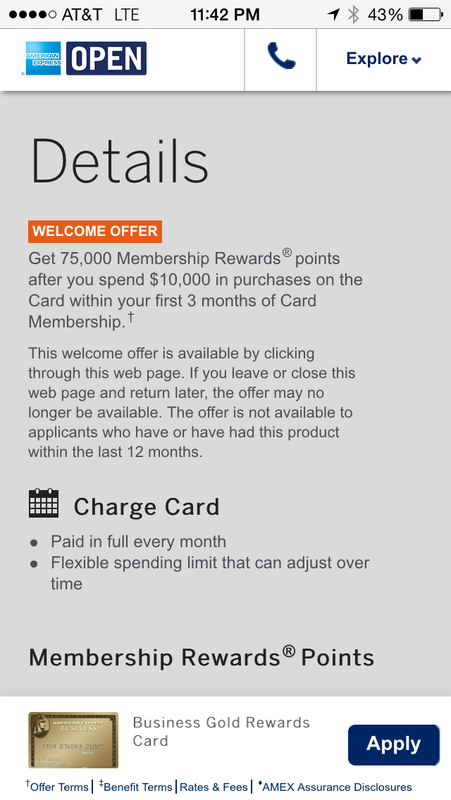 I thought Amex changed their T&Cs earlier this year to limit sign up bonuses to one-time only? Please advise! That limit is for personal cards. In the terms of this application, it very clearly says not avaiable to those who have had the card in the past 12 months. Might send in the 75K pic if I get approved, for a match. Getting to the link was tough.